Minimalist composer Steve Reich and his wife, video artist Beryl Korot, gained notoriety in 1993 with their collaboration on the large-scale "documentary video opera" The Cave, which investigated the roots of Christianity, Judaism and Islam through the story of Abraham. Prerecorded interviews with men and women of the faiths involved were shown on an array of multi channel screens, together with location footage shot in the Middle East, while an ensemble of instrumentalists and vocalists provided musical counterpoint and commentary, the speech patterns of the interviewees providing the starting point for much of the score. The result was epic in its episodic transformation from performance art to a seeming intellectual communion of idiomatic symbols, each dissected to its basic profound meaning. This is not something that the typical opera lover expects to see, especially when certain stories examine the underlying question of human existence -- whether or not we are to be held responsible for our actions. That being said, when you see a Reich/Korot collaboration be prepared to sit and wonder about the religious war between the human mind and the human G-D. Where technology meets imagination lies the artistic style that has branded Reich and Korot over the past few years. Steve Reich, an award-winning and groundbreaking composer, provides the music. Beryl Korot, an internationally exhibited installation artist and painter, provides the images. This creates a collaboration of intuition, depth and cooperation, all the while playing messenger to a new world which ultimately justifies their mission as artists. Many of the tools Reich and Korot now employ for their installations didn't exist when they began working together in the 1960s and 1970s. Digital editing software developed in the 1990s allowed Korot to create and manipulate complex pictures on her computer screen and simply project them onto a single screen. In the past, Reich was known to use taped speech while allowing the natural hiccupping of the talk to set the tempos and shape the rhythms of his music. With computers Reich can now manipulate sound more easily by stretching or compressing sound bites, a term Reich calls "slow motion sound", creating a whole new fabric of possibilities. It is indeed an exciting era for the future of music. Four years in the making, Reich and Korot have now produced Three Tales, which premiered in May 2002 at the Vienna Music Festival and made its New York premiere at the Brooklyn Academy of Music last Tuesday as part of the twentieth Next Wave Festival. The production features a tighter, more updated version of the technique used for The Cave, complete with one screen that hangs in the middle of the proscenium, 10 instrumentalists, three counter-tenors and two sopranos. All of the singers were dressed in shining silvery slacks and dresses and moved up and down the platforms like robots (A sign of the future, perhaps?). Three Tales focuses on the technological advances and perils of the twentieth century, specifically on three key moments in modern history: the industrial age's crash of the Hindenburg zeppelin over Lakehurst, New Jersey in 1937; the atomic age's introduction of hydrogen bomb testing on Bikini Atoll in 1947 (which displaced 167 native inhabitants from the island that is still, to this day, uninhabitable); and the genomic age's infamous cloning of Dolly the Scottish sheep. To say that Three Tales is a "video documentary opera" is fitting, mainly because there is no technical genre to describe exactly what Reich and Korot do. It is a collaboration devoted to a new form of performance art or, shall we say, music theater. In this case, the term music theater should hold the same weight as "music and video performance in a theater". The theater complex itself is merely a stage where not only the music will be studied but the video images absorbed. Still in its infant stages, this is an art form that is thriving in the first years of the twenty-first century, but that has yet to receive a name. Whatever it shall be named Three Tales is performance art on a grand scale, grand enough to fill an opera house that seats over 2000 audience members. With vivid scenes made from vintage film clips, photographs and Korot's drawings combined with the somber and pulsating music of the Steve Reich Ensemble and Synergy Vocals, Three Tales presents itself as an uber-opera, as if it rises to a new level of sophistication, a melding of two artistic worlds into an uncomfortably enlightening drama. It presents the unpredictable drama of human achievement along with the innocent ignorance of attainable wishes -- an opera gilded in tragedy but tinged with futuristic fantasy. Of the three tales, I found "Hindenburg" to be the most musically satisfying, mostly because of the intense ring of the countertenors repeating the line, "It could not have been a technical matter," creating a "speech melody" supported by the undulating pulse that has signified Reich's work for decades. His canonic approach to a single note has a hypnotic effect. Reich studied percussion at the Institute for African Studies at the University of Ghana in Accra, and as much of his music is based on non-Western, particularly African tribal rhythms it is possible to find one's self succumbed to the numbing wave of melodic intonations. Ideally, the images and music would match, but Korot's work in this case was not as innovative as the music. While her images presented a clean-cut visual accompaniment to Reich's score it all seemed to lack visual imagination. Maybe less is more for Korot, but choices like using typewriter font seemed almost too plain and mechanical. The music for "Bikini" was less stimulating, almost lethargic, soothing the audience while we witnessed disturbing images of American soldiers testing areas for their nuclear war toys. This is possibly some of the saddest music that Reich has composed (images of palm trees disintegrating by hydrogen blasts don't evoke the sunny feeling of a Hawaiian ukulele, after all). When this soft brooding music was melded with the Gaugin-like images of Bikini's native islanders packing their meager belongings and waving goodbye to their home (Korot turned live film footage of the islanders into photographic stills, made the stills painterly and animated them at a different frame rate from the usual 30 frames per second), it left the most indelibly sentimental mark of the evening. "Dolly" was the most entertaining and thought-provoking segment of Three Tales. With a cast of eighteen scientists from all over the scientific map and an adorable robot named Kismet, this "talking head" drama became the platform that Reich and Korot visualize as their "theater of ideas". The scientists became a cast of actors, manipulated both visually and audibly by the computer to make their personalities all the more curious -- an enjoyable yet unusual piece of music theater giving insight into some of the most advanced genomic principles in the world today. A lesson in ethical and godless opinions, or rather a means of enlightenment when one thinks of how destructive our own future can be -- all created by the machines that humans invented. Reich's percussive attacks loomed over biologist Richard Dawkin's words, "We, and all other animals are machines created by our genes." Reich manipulated the speech even more when he looped "machines" into a repetitive ticker tape frenzy. Did Reich need to loop this phrase over and over again to understand these ponderous implications for himself, or was Reich trying to make a demon out of a scientist who pays no attention to religion? By slowing down the sound of an interviewer's voice we were guided by Reich's own idea of the instant. A simple "machine" could be looped several times or "a f r o z e n u d d e r c e l l" stretched out by the computer as if the elongated words could prolong our cognitive affirmation of its meaning, as if Reich were playing G-D while the interviewees and music became marionettes to the rhythms of Reich's simulated universe. By slowing time Reich makes a point, or rather extends a point to get his message across. A message of religion, science, technology, machinery, and death, presented more like a programmatic sermon rather than a tale, one that re-imagines the twentieth century by using tools available only in the twentieth century. In a sense, Three Tales is a bittersweet love letter romanticizing the tragic beauty of destruction and the inevitable folly of human achievement. In Three Tales, iconography becomes art, science becomes religion. These three incredible stories, joined by the hauntingly impressive yet overplayed images of September 11, became icons unto themselves -- the elegant flames of the Hindenburg, the awesome power of an atomic bomb and the future of genomic wizardry as a cloned sheep looks you in the face. Reactions to these events have sparked positive and negative aspects in the technologies that relate to our lives, and Reich and Korot see the impact of media on the social and cultural environment as a driving force of their work. 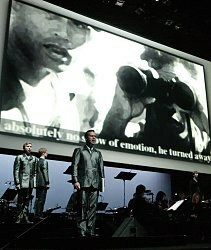 In short, Three Tales is a gathering of audience members confronting tragedy in a form that has been surpassed only by the ancient Greeks, only this "Euripides" has a musical score played forcefully by an instrument ensemble, singers and a large screen projecting perfectly timed portraits of technology. All together juxtaposed in a complex means to help us battle the frustrations, paranoia and ethical feelings that make life so stimulating. After experiencing this gigantic work of art one can understand Richard Dawkins' statement, "If you want to understand life think about information technology."